When I lived in the UK, fresh ripe apricots, peaches or melons were near-impossible to find. As nice as they looked, they were either rock-hard or tasteless, or both. I am now living in the Lot in France and I can simply go to the local market 15 mn away to buy large trays of ripe and juicy fruit at little more than €1 or 75p per kg. I make jams and cook for the freezer for the winter months. I eat a lot more fresh produce, which does not travel hundreds of miles. Everything is produced regionally and picked when ripe. I am working on growing my favourite veggies next year, reducing the costs even more. I often wondered who bought those trays of peaches that were only good for at most two days. People with very large families maybe? or people who want to make jam like Claudine, Charlie. Resisted the temptation anyway! Great post, and so true. I think still having the infastructure of local food and local markets helps an awful lot, as well as never having lost the seasonal food aspect. That said, as much as I adore everything I find, I do always get a craving for a decent curry at the end of our 3 weeks! There is usually a curry on offer at the market at St Jean D'Angely. Can't miss it, great smell drifting round the market and it's housed under a canopy from an old Citroen van. Pining to be back in the Charente now though! Agree on the curry front, Helen. I do miss spicy food. But the fruit here is truly wonderful. 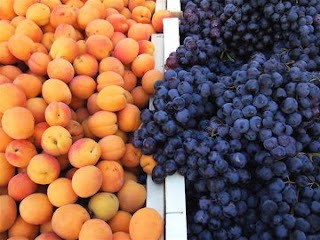 Since I wrote the post have been scoffing the new season's grapes, melons, peaches like there's no tomorrow! just back from the French Alps - we have also been gorging ourselves on peaches, nectarines and apricots, as well as plums - greengages, reine claudes and mirabelles in particular. We always eat so much better on holiday, my children have been complaining they are hungry constantly since our return!